This is question set #19 of ‘Clear IAS Mains High Value Answer Writing Test Series’. Mains High Value Answer Writing is a UPSC mains oriented program from ClearIAS.com that consists of 5 questions in each post, published around 8 pm every day. Each of the 5 questions are selected from 5 papers mentioned in UPSC Mains syllabus namely Essay, GS1, GS2, GS3 and GS4 (ethics). Selected questions of high probability to be asked UPSC mains are included in each of these mini tests. Aspirants can choose any question they wish to answer in the comment space provided below, specifying the question number and question topic. Can I give mock test and writing test in Hindi medium? You can write Vinay, and the fellow participants/seniors may provide feed back too. 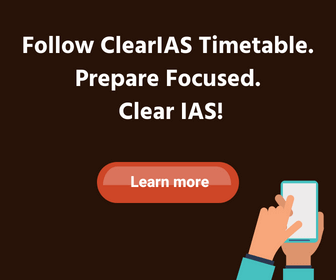 As of now the official Clear IAS Team gives feedback/review only in English. The Art 15,16 of constitution prohibits the discrimination and provides for employment in public offices to backward classes.Art 17 prohibits untouchability. As per DPSP,the State shall promote with special care the educational and economic interests of the weaker sections of the people.Reservation of seats for ST,SCs in Parliament, Legislative assembly, panchayats; appointment of Minister of Tribal Affairs, National Commission for SC and ST are some of the steps taken. Laws for bonded labour, immunity from debts,distributing land to Harijans,education facilities,assistance in cottage industries and more political power have moved out the Dalits from the dearth of suffering. In addition to above steps government needs to focus on infrastructure development, stringent implementation of Minimum Wages Act, efficient PDS, rehabilitation of bonded labourers and scavengers and filling of reserved backlog seats at the earliest for the upliftment of Dalits. Alpa, good! We see an improvement in the quality of your answers. Keep it up. Ans. The Indo-US relationship had always ups and downs however after 2000s India it has mostly seen an upward trend. sanctions imposed after 1998 nuclear tests have been lifted and there is NSSP+ in place to move ahead in strategic relationship. Most ever active role being played by USA in west Asia in fighting ISIS and their dependence on help from world community including India. The routine military exercises between Indo-USA-Japan navies are also good signs. The active involvement of USA in Indian ocean is aimed at “Containing China” is also good for India as it coincides with Indias Look East 2.0 policy. Indo-US Civil nuclear deal is yet to pass the hurdle of liability bill pending in India. The opening of FDI in defence may see huge investment by USA arms companies in India. However, the so called “war on Terror” funding by USA to Pakistan and slipping the same resources to anti India operations by Pakistan is still a concern for India. Ukraine issue has also put India in a dilemmic situation due its strong relationship with Russia. The issues like frequent FDA sanctions on Indian drugs, stringent visa rules,USA insistence on India’s signing CTBT/NPT, IPI,TAPI pipelines are still disturbing issues. Recent years has seen rise in technology transfer and collaborative R&D projects. The Indo-US relationship has come out o the shadow of Indo-Pak relationship.The bilateral trade has grown manifolds and trhe trade balance is in India’s favor. Amrit, Some points you could have added : 1) Devyani Khobragade incident. 2) Indian defense deals with France instead of US 3) Civil Nuclear Liability Bill 4) Issues associated with FDI in multi-brand retail etc. The relationship between largest democracy and the oldest democracy is the one, on which whole world keep its eyes on. Both Indian and American economies are interdependent and interlinked, as most of IT professionals in US are Indians. In recent times both nations have strengthened the ties in each and every aspects of economy, world politics, defense etc. Both are fighting for a common cause that is terrorism. Although the relationship was in good state from past but major development in Indo-US relationship entered into a new dimension after Civil Nuclear Deal. This was the great achievement for both sides. Recently, the issues of Indian Foreign Service official created some kind of tension,but both sides with positive mind set solved the issue. Now, both sides should focus on pharmaceutical issues related to patents and solar panel issue, so that these two important matters can be solved without any harsh implications on the industries of both sides. Apart from all ups and downs, both countries should focus on environmental issues, terrorism issues and other Geo-political issues so that peaceful coexistence can be maintained globally and the world can become safest zone for each and every one. Vikas, the answer is too general. Ofcourse, there are some good points like patents, but try to add more specific points. India-US bilateral relations have developed in a global strategic partnership covering trade and investment, defence and security, education, science and technology, cyber security, high-technology, terrorism, civil nuclear energy, space technology and applications, clean energy, environment, agriculture and health. People to people interaction provide further vitality and strength to bilateral relationship.USA reaffirmed its desire to see India as a permanent member of a reformed United Nations Security Council. India and the U.S. have different perspectives on Pakistan, Afghanistan, Iran, Syria, Climate Change, the Doha Round, sovereignty issues, global governance, WTO food security issue. The India’s say on imposing supplier liability on nuclear vendors is not acceptable to USA. A doubt rises in mind of US if it is excluded from defence contracts.The USA policy towards Pakistan, despite its terrorist affiliations and disruptive role in Afghanistan make situation more vulnerable. There has been questioning of role of India in Afghanistan by US. USA is also skeptical regarding naval exercises in Pacific and Indian ocean by India and Asian nations. The strategic dialogue is a good beginning for India-US relations. Sustaining it through crises will be the real challenge. Not a bad attempt. You may also go through the feedback given to Amrit. 1)	Low or no land holdings. 2)	Most involved in unorganised sector. 1)	Bad infrastructure in villages for education and medical help hits Dalit’s the hardest. 2)	Violence from more dominant communities. 3)	Involvement in so-called ‘impure’ jobs like manual scavenging and are not requested but demanded to perform them. Steps taken by the government for upliftment. 1)	Constitution bans discrimination and strict laws like scheduled caste and tribe (prevention of atrocities) act 1989. 2)	Policies for employment (MGNREGA) and better living (AAY) to improve living standards. 3)	Reservations in educational institutes and occupations for social inclusiveness. 4)	Land distribution and limit imposition by GOI. 5)	Promotion of self-help groups and Pradhan Mantri Jan Dhan Yojna for financial empowerment. 6)	Protection and support to SMEs which employ large numbers of SCs. 7)	Manual scavenging has been banned in India. These steps though being in the correct direction fall short. Government should promote equitable growth in India and try to lower the wealth gap. In most of cities and villages, untouchability is not practiced but discrimination still remains. Efforts should be made to promote amiability between communities. Avi, a good structured answer. A little bit of polishing/additional details would make this answer a high value one. Indo-US relations always had ups and downs. Analyse the recent issues in India-US relations. India and USA had good relations at the time of independence. Freedom struggles like Gadhar movement were based out of USA and the nation was generally sympathetic to the cause of Indian independence. USA supported India in the most desperate times by sending wheat under PL 480 scheme in the past and even today the two nations enjoy a very warm relationship. However, relationships were strained during the Indo-pak wars and the subsequent nuclear test by India in 1975. After liberalisation, things turned for the positive but in 1998 with Pokharan nuclear tests we had to face a new set of sanctions form USA. 1)	Free trade between the nations. 2)	Bringing down non-tariff barriers. 3)	Protection of Intellectual rights. India has had specific requests: more technology; simplify visa regulations. 5)	Nuclear power- technology and fuel. 6)	Better military compatibility, co-operation and trade. 9)	Terrorism training and information exchange. Other areas of co-operation and humanitarian development. 10)	Agricultural technology and research. 11)	Immunisation, sanitation and nutrition programs in India. Avi, not a bad attempt, but you could have framed this answer better. Please check the feed back given to other participants on the same question. The question focus was on “issues”. -He advocated a teaching system that analysed history and culture for the progress that had been made in breaking down social and religious barriers. -He advocated new cultural fusions with thought that multiculturalism can exist within a single human personality. -He argued for a humane educational system that was in touch with the environment and aimed at overall development of the personality. -He does not lay stress on religious instruction. -He stressed on revival of performing arts like dance,drama,music to realize the inner worth. -He articulated cooperative principle for giving way to collectively owned economy. Tagore’s poems were steeped in mysticism.Tagore believed that true knowledge is that which perceives the unity of all things in God and God is the one who can provide the greatest love and joy. Tagore never looked upon nature as something hostile to man. Like all mystics he was a firm believer in the essential unity of man and the external universe.Tagore realized that death is the fulfillment and completion of life that in death nothing is lost and it is the channel through which life ceaselessly flows and renews itself. –	International union for conservation of nature and natural resources is a body with 74 member nations and multiple national agencies. It helps the find solution to most pressing environmental and development challenges and also publishes the IUCN red list of threatened species annually. –	World Wildlife Fund is an international organisation that is involved in spreading awareness and saving endangered species worldwide. –	Convention of biological diversity was formed after the earth summit (Rio de Jeneiro) in 1992. It is focussed on sustainable usage of natural resources to slow down the erosion of biodiversity. –	Species survival commission (SSC) and convention for international trade in endangered species of wild flora and fauna (CITES) work together for spreading knowledge and creating international consensus for protection of wild flora and fauns. –	Bombay natural history society- It is involved in spreadeing awareness regarding the importance of preservation of wildlife and forest heritage of India. –	National Biodiversity Authority- It is an organisation under MoEF involved in analysing the status of biodiversity and conservation. It acts as facilitating, regulating and advisory body to the Government of India. An average answer; need to add more details/points.